I’m so excited to be back in your blog Seumas. It is a delightful honor and I hope you find my post worthy of your wit and charm and exceptional blogging platform. I wanted to share a little bit about my writing and celebrate my new release, Shattering Time, the second book in the Stealing Time Series. As a fellow writer I think you will understand the bliss of releasing a book you’ve spent a year or more writing and the immense sense of relief at the freedom to focus on something else for a while. First, I would like to ask your readers an intriguing question. If you could go back in time where would you go? One of the beautiful things about being a writer is you can dive into this type of conjecture and explore in a deeper way what this would entail. Choose wisely, for my research has shown that perhaps the imaginings of being in that particular place may far exceed the reality of that visit. The Stealing Time Series addresses this time travel question in depth. Of course, after I’ve made the book a page-turner and put my poor heroine, Ronnie Andrews, in such terrible trouble repeatedly, I would NOT choose these times and places to visit in reality. It has been a great adventure to do so as a writer though. The areas I have chosen for Ronnie to explore were just the kernel of desire and intrigue that put me on the path of discovery. In Stealing Time, I chose 1752 London at a time where there was a literal shift in time from the Julian Calendar to the Gregorian Calendar. The English along with its colonies, lost 11 days that September. I couldn’t resist this gold mine of intrigue and mystery as a back drop for my debut novel. 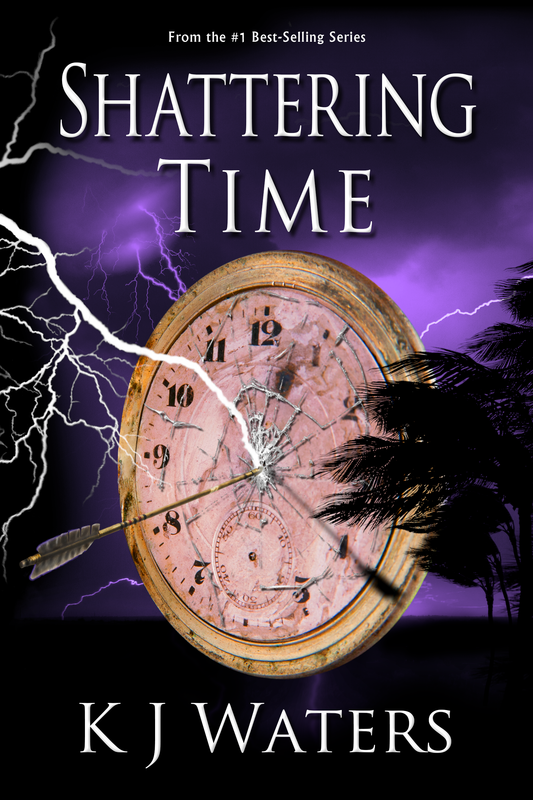 In the next book, Shattering Time just released last week, Ronnie is taken to three different places and times. First, she is deposited on a beach in the Bahamas in 1952 with beautiful crystal clear waters and a handsome man to join the fun. Only problem is that they are shipwrecked and like the genie that grants your wishes there is a twist that ends up biting you in the…um, I don’t want to give away too much. Her last destination in that book has always been intriguing to me – The Lost Colony of Roanoke Island. It is one of America’s first mysteries where we find English colonists attempting to create the first colony in the New World in 1588. To this day no one knows what happened to them. It was a challenge to come up with my own version but I hope you do check it out and see what happens to Ronnie in that special time and place. 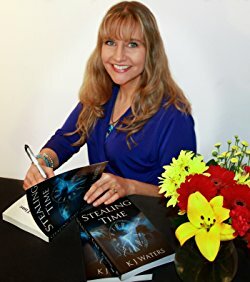 I would like to invite you to a special sale on the first book in the series, Stealing Time, that is available as an eBook for only 99 cents until July 7 on Amazon here: http://geni.us/StealingTimeGuestBlog. If you prefer paperbacks, I can offer you both books in the series for $25 plus shipping, that’s a savings of $5, click here: http://geni.us/webpromo. Please visit my website at kjwaters.com and join my newsletter. KJ Waters is the Amazon best-selling author of the short-story called Blow and #1 best-seller Stealing Time. The second book in the series, Shattering Time, was just published on June 27, 2017 and the next day reached #6 on the UK Amazon site, and was #2 as a hot new release for one category, seating neatly after Michael Crichton’s Dragon Teeth. In addition to her writing, she is the CEO of Blondie’s Custom Book Covers and the co-host of the popular podcast Blondie and the Brit. The number one best-selling thriller Stealing Time continues its “breathtakingly original” journey. Ronnie Andrews returns from eighteenth-century London shell-shocked from her first terrifying time travel encounter. Her boyfriend, Jeffrey Brennan, casts doubt on her sanity leaving Ronnie wondering if she went back in time or is having a mental breakdown. To add to the tension, Hurricane Frances, a storm the size of Texas, is barreling towards Florida and her fears of a repeat time travel experience mount. Ronnie’s best friend Steph, along with her friend Nick and Steph’s younger brother Ian, shield Ronnie from the dangers of Frances but cannot save her from traveling back in time. Unfortunately, their meddling brings Ronnie to the brink of destruction as they are caught in the throes of the hurricane’s wrath. Once again, Ronnie is transported to dangerous places and plagued with desperate situations, while experiencing perilous cultures including one of America’s first mysteries — the Lost Colony of Roanoke Island. A stunning conclusion brings Ronnie face to face with a dangerous ally who may hold the key to her past while offering salvation for her future. …thanks for this, m’Lady, K.J. … see yeez later… LUV YEEZ! Oh wow thank you so much Don!! Suzanne, so grateful for Seumas and his willingness to support authors like me!